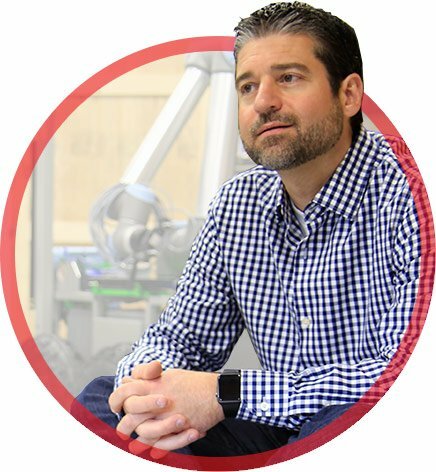 At Waypoint Robotics, people are our passion, and we create products that empower the American workforce. Vector, our compact, industrial strength, omni-directional mobile robot was built to work alongside today’s skilled workforce – not replace them. Imagine offsetting the lifting and delivery of a 300-pound engine to shipping or automating the retrieval of boxes of parts to a robot enabling the worker to stay focused on their skill at hand while reducing the unnecessary physical labor. The worker can also spend more time developing their skills and furthering their career versus worried about when they can no longer do their job. This is why our motto is Workforce First – We build robots for people who put them to work. Waypoint Robotics is about 18 months old, and we have delivered over 24 Vector robots. Considering Vector costs as much as a higher-end car, this is an excellent business accomplishment in only seven quarters. Staying connected to the New Hampshire and Massachusetts tech and robotics communities and their resources are critical for us. These communities are not huge but represent significant opportunities for participants. We all work together to understand each other’s products, how they fit in the market, and where collaboration could happen as an example. In New Hampshire, Waypoint Robotics was accepted into Alpha Loft’s Accelerate New Hampshire program, and we recently applied to the New Hampshire Tech Council’s 2018 Product of the Year Award. These programs provide us visibility into the startup and investor ecosystem, and their promotional efforts help bring in prospects. More so, it provides validation for our buyers and users that they are getting the best products in the autonomous robotics market from a company they want to do business with. Even though we have the support and stability of Stanley Innovation (and parent company Stanley Elevator) behind us, we are still a bootstrapped manufacturing organization meaning that we have to invest significant financial resources to build products before they are sold. How we handle every decision and challenge is vital to our success, and we have been quite successful in selling and implementing Vector into some of the most innovative, progressive organizations in the country. We absolutely love what we do which helps us stay focused and make good decisions when obstacles present themselves. Best advice you have led with? People are the center of everything I do. We all change as we grow our careers and become entrepreneurs. For me, one thing really sticks, and that is connecting with the people I work with, their families, and with the customers (aka users) I serve through the innovations we create is why I do what I do. Is this advice? Perhaps not but improving the lives of people will remain my compass, and with this, I hope to build the company our team envisions. What is not to love about New Hampshire. Being here presents a unique value proposition for Waypoint to hire great people who want to work in robotics, leave the hard commuting behind, and embrace a fantastic quality of life. Our headquarters location in Merrimack enables all employees to stay connected to the tech and robotics communities and also access one of the largest concentrations of contract manufacturers in the U.S. who are early adopters of autonomous robots that help the workforce. We have recently crossed a significant threshold in product development. September marked the completion of a new release of Dispatcher, the Software-as-a-Service (SaaS) platform that supports the robots, and we had significant updates to Vector. We will continue to work on our SaaS offerings and implement enhancements to our products from ideas we have received from our customers. For the business, it’s time to start building out our sales team.